U.S. President Barack Obama and first lady Michelle Obama arrive at José Martí international airport in Havana on March 20, 2016. Air Force One, painted in blue and white, made a smooth landing at José Martí International Airport in Havana yesterday afternoon. Out stepped American President Barack Obama, black umbrella in hand, as he sheltered himself and first lady Michelle Obama from a rain shower. They climbed down the steps, followed by their family, and stepped onto Cuban soil, making history. 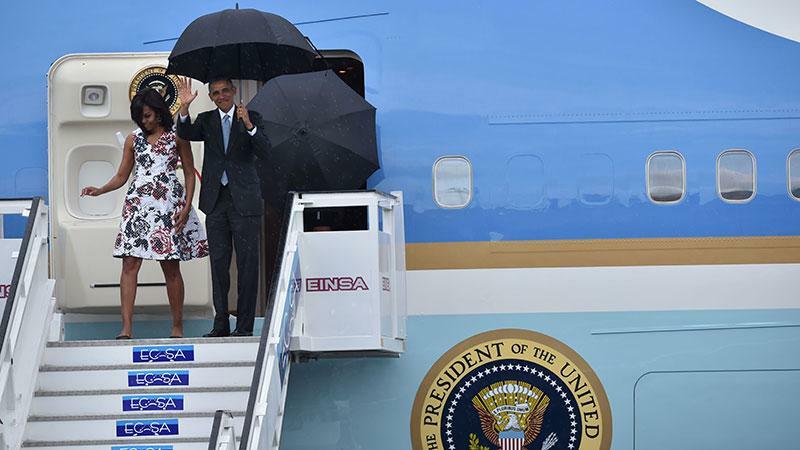 It was the first time in 88 years that a sitting American president had arrived in Cuba. With a friendly, informal message sent over Twitter—"¿Que bolo Cuba?" or "What's up Cuba? "—the president embarked on a short visit to Havana. Joining him were nearly 40 members of Congress, the largest such delegation of the Obama presidency, along with some American business leaders. Obama began with a tour of Habana Vieja, or Old Havana, laying a wreath at the memorial to Cuban hero José Martí and moved on to meetings with Cuban President Raúl Castro. He also will meet with Cuban civil society leaders and dissidents, as well as attend an exhibition baseball game played between Cuba's National Team and the Tampa Bay Rays of Major League Baseball. "For more than half a century, the site of a U.S. president here in Havana would have been unimaginable. But this is a new day. Es un nueva dia," said Obama. "We have a half a century of work to catch up on. ... This is a moment filled with great emotion. ... For many, this is a time of new hope." President Barack Obama waves as he walks in heavy rain during his visit to Havana, Cuba. During a mutual press conference, both Obama and Castro stressed that there are differences between their respective countries. Obama mentioned human rights and democracy, while Castro spoke about the American base at Guantanamo Bay and the blockade—the Cuban term for the U.S. embargo against Cuba, which remains in effect and can only be dropped by U.S. Congress, not the president. Changes between the two countries have abounded since December 2014, when it was announced that they would take steps to normalize relations. "Over the past year, the number of Americans traveling here has surged," said Obama. "U.S. airlines will begin direct commercial flights this year. ... With only 90 miles between us, we’re natural trading partners." When asked about the embargo by a reporter, President Obama said: "The list of things that we can do administratively is growing shorter, and the bulk of changes that have to be made with respect to the embargo are now going to rely on Congress making changes. I've been very clear about the interest in getting that done before I leave. Frankly, Congress is not as productive as I would like during presidential election years, but the fact that we have such a large congressional delegation—with democrats and republicans with us—is an indication that there is growing interest inside of Congress for lifting the embargo. How quickly that happens will, in part, depend on whether we can bridge some of our differences around human rights issues, and that's why the dialogue is so important." "The embargo is going to end," said President Obama. "When, I can't be entirely sure, but I believe it will end and the path that we're on will continue beyond my administration. The reason is logical. What we did for 50 years did not serve our interests, or the interests of the Cuban people. ... I have faith in the Cuban people. Change will occur."